Wide range of driers for Oil Paint. These driers help painters who used oils, to accelerate the drying of his paintings. 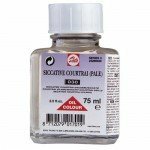 Light cobalt siccative Talens, 75 ml.